A new MIT study shows how changing colors of Earth’s oceans can be used to monitor climate change in the relatively near future. 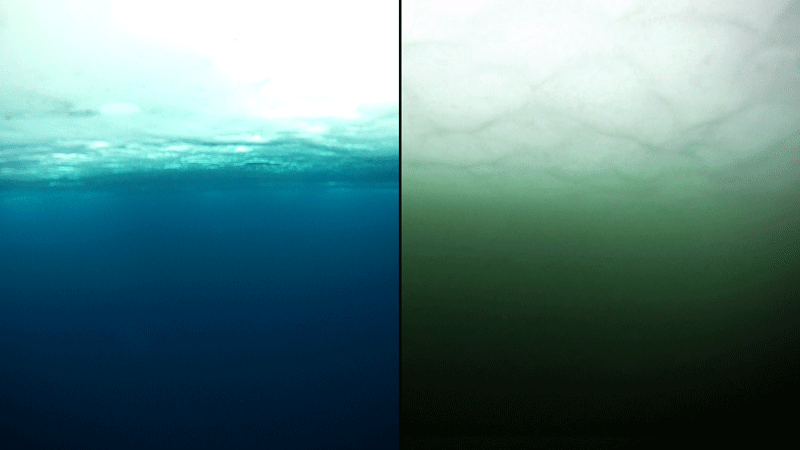 Earth’s oceans are typically blue and green in color. A new MIT study says those colors will be intensified by climate change. Image via NASA Earth Observatory. Earth’s oceans have been measured as warming due to overall climate change. This same warming is having other known effects on Earth’s oceans, including damage to coral reefs. Plus, it’s known that ocean warming is causing the growth and interaction of different species of phytoplankton, commonly known as algae. The changes in algae are expected to increase as temperatures continue to rise, and – according to the results of a new study, released February 4, 2019 – they’ll also have an additional, perhaps surprising, effect: that of altering the colors of Earth’s oceans. Massachusetts Institute of Technology (MIT) researchers reported the findings in a new peer-reviewed paper in Nature Communications. NASA and the Department of Energy helped support the research. Using a global model that simulates the growth and interaction patterns of the different phytoplankton species, and also simulating how phytoplankton absorb and reflect light, the researchers found that those changes will affect the ocean itself by intensifying the color of the surface water. 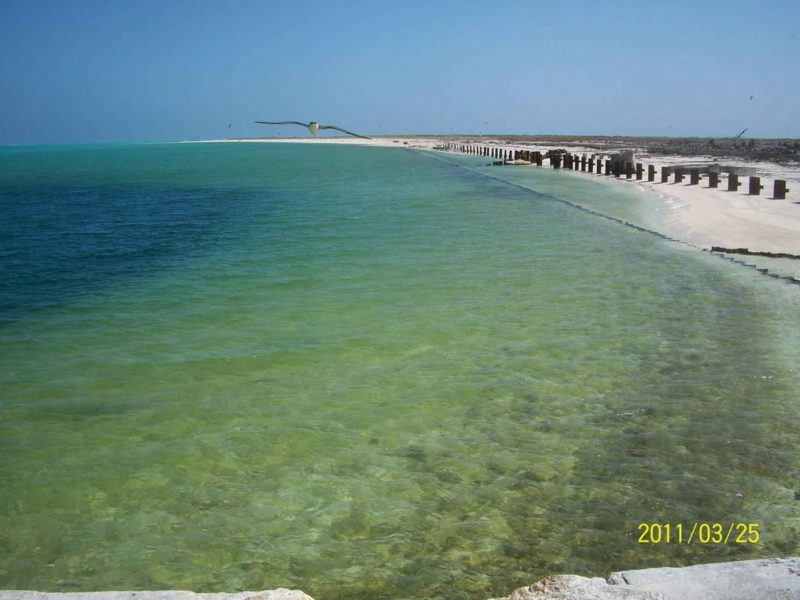 The study suggests that more than 50 percent of the ocean water will experience the change in color by the year 2100. In the future, scientists will be able to track climate change by looking at how it affects phytoplankton and the resulting changing colors of the oceans. Image via Wikimedia Commons. 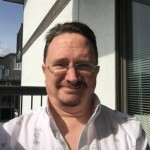 The model suggests the changes won’t appear huge to the naked eye, and the ocean will still look like it has blue regions in the subtropics and greener regions near the equator and poles. That basic pattern will still be there. But it’ll be enough different that it will affect the rest of the food web that phytoplankton supports. How did the researchers reach these conclusions? First, they wanted to see if they could see the effects of climate change on phytoplankton by looking at satellite measurements of reflected light alone. They updated a computer model previously used to predict phytoplankton changes with rising temperatures and ocean acidification, which takes information about phytoplankton, including what they eat and how they grow, incorporating that information into a physical model that simulates the ocean’s currents and mixing. Then the researcheres included something new, an estimate of the specific wavelengths of light that are absorbed and reflected by the ocean, depending on the amount and type of organisms in a given region. An ocean algae bloom photographed in 2011. Such blooms tend to give the water a greenish hue. Image via Wikimedia Commons. Sunlight will come into the ocean, and anything that’s in the ocean will absorb it, like chlorophyll. Other things will absorb or scatter it, like something with a hard shell. So it’s a complicated process, how light is reflected back out of the ocean to give it its color. The nice thing about this model is, we can use it as a laboratory, a place where we can experiment, to see how our planet is going to change. 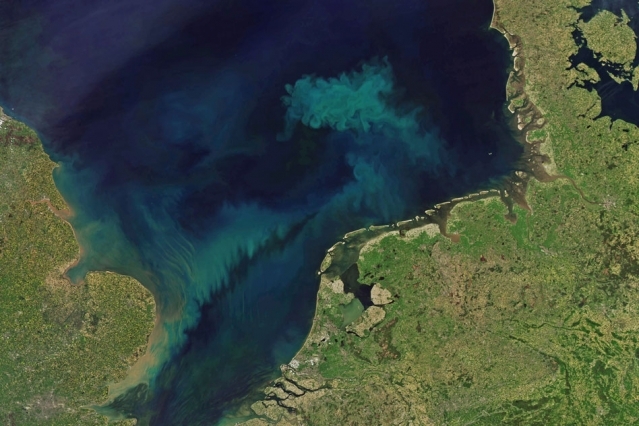 Arctic water turned green by phytoplankton blooms. Image via Karen Frey/Clark University/NASA. The researchers increased global temperatures in the model by up to 3 degrees Celsius (about 6 degrees Fahrenheit) by the year 2100. They found that wavelengths of light in the blue/green waveband responded the fastest. That amount of temperature increase is what scientists predict will occur in a scenario with little-to-no political action taken to combat climate change by reducing greenhouse gases. They also found that significant climate-driven change in chlorophyll could occur by 2055, earlier than previously thought. What creates the ocean colors to begin with? It depends on how sunlight interacts with whatever is in the water. By themselves, water molecules absorb almost all sunlight except for blue, which is why the open ocean will look deep blue as seen from space. But ocean water that contains a lot of phytoplankton will appear more green, since the phytoplankton contains chlorophyll, which absorbs mostly in the blue portion of the sunlight spectrum. More green light is reflected back out of the ocean, giving algae-rich regions a greenish hue. An El Niño or La Niña event will throw up a very large change in chlorophyll because it’s changing the amount of nutrients that are coming into the system. Because of these big, natural changes that happen every few years, it’s hard to see if things are changing due to climate change, if you’re just looking at chlorophyll. Chlorophyll is changing, but you can’t really see it because of its incredible natural variability. But you can see a significant, climate-related shift in some of these wavebands, in the signal being sent out to the satellites. So that’s where we should be looking in satellite measurements, for a real signal of change. There will be a noticeable difference in the color of 50 percent of the ocean by the end of the 21st century. It could be potentially quite serious. 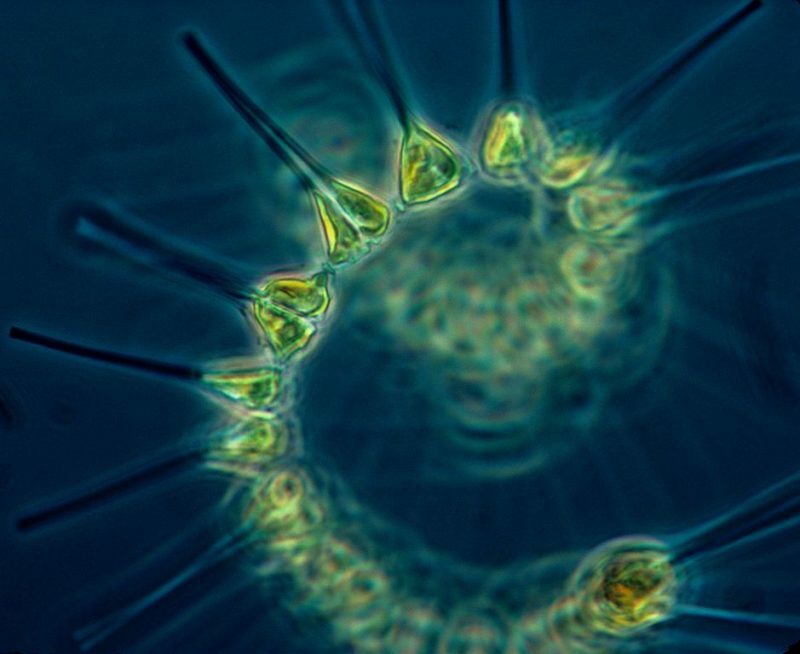 Different types of phytoplankton absorb light differently, and if climate change shifts one community of phytoplankton to another, that will also change the types of food webs they can support. Hurricane Jose as seen from space in 2017. 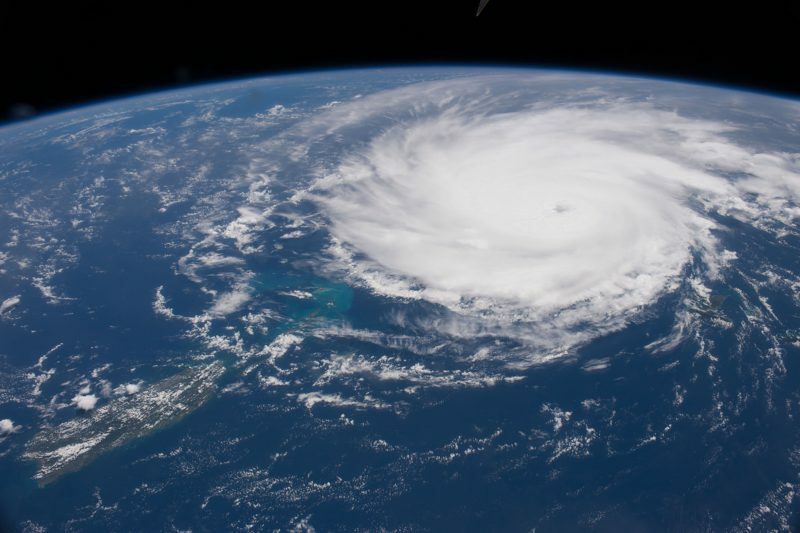 It’s thought that global warming will likely lead to more intense hurricanes. The warming water is already having an adverse effect on coral reefs. Now scientists say ocean warming will also change the colors of Earth’s oceans in this century. Image via Earth Science and Remote Sensing Unit/Johnson Space Center. Bottom line: Scientists have measured a warming in Earth’s ocean. New research from MIT suggests this warming will – in this century – increase the intensity of the oceans’ colors, via ocean phytoplankton. The change will make the ocean’s blue and green hues more vibrant than at present. The change won’t be detectable to the eye in this century, but it will be enough to affect the ocean food web, which phytoplankton supports.